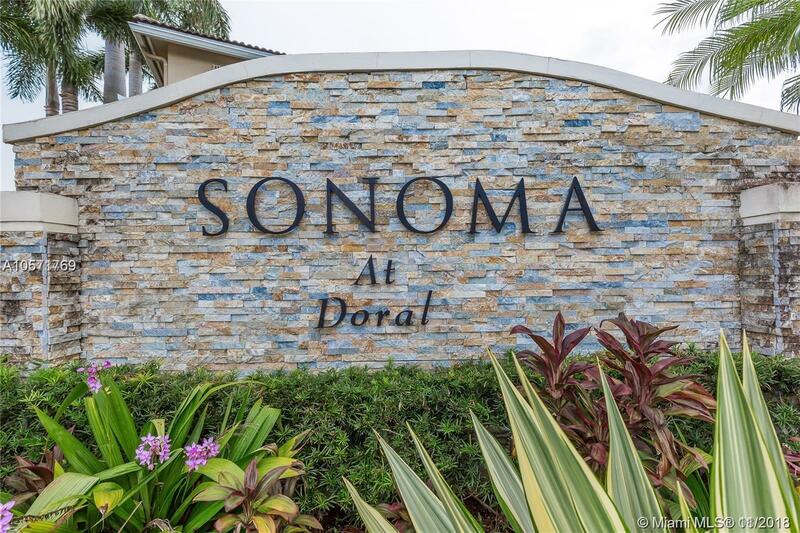 Contemporary fully renovated and spacious townhouse in the gated community of Sonoma at Doral with 24/7 security. This beautiful bright home features 3 Br, 2 1/2 Baths with one car garage, 2 driveway parking spaces, and visitor parking. Granite Counter Top in the Kitchen with stainless steel appliances. Hurricane shutters, energy efficient water heater , washer and dryer, crown molding throughout the entire house. Spacious walk-in closet. Ceramic floor in the first level and wood floor in the 2nd level. No neighbors in the back and paved patio. Excellent exposure to the sunlight. Walking distance to a A-grade schools and two public parks. Sonoma is a very well established community with low maintenance. Must see! !